Quality Lessons or Cheap Lessons? Penrith Driving School provides the best quality and most informative driving lessons that give you the best value for your money. This is based on feedback we receive from customers or students that have compared our driving lessons to other previous driving lessons purchased from other driving schools. It comes down to the instructors if you have a good teacher then you will learn properly, but if you have an inexperienced teacher or a teacher who is just after your money then you won’t get what you expect so you end up buying more and more lessons but don’t get the results. Some driving schools can charge up to $85 per 60-minute lesson others may charge as low as $45 per 60-minute lesson or even less but what are you actually getting? Our $60 lesson is, in fact, is only $54.55 but because we contribute to the economy by paying GST it becomes $60. Our lesson prices include the federal government’s 10% GST in our prices which some other driving schools don’t charge as they claim not to be meeting the GST threshold. Eventually, all people or businesses who rip off the tax system will get caught by the ATO. Some driving schools only accept cash without providing some form of receipt, another reason they may be cheaper. If you work your employer collects tax on your behalf for the ATO, your employer will also pay the GST but some businesses and individuals avoid their tax obligations. Driving lessons can be like anything you buy these days some items you buy might be cheaper but how long do they last? If you are buying driving lessons just based on the price or whoever answers the phone first that’s up to you. Buying quality information and informative driving lessons can last a lifetime. Cutting corners to save a few bucks usually comes back on you in the end. People choose us for a reason because we only do informative and quality lessons. We regularly have students that have had previous driving lessons with other driving schools. Students are not able to show us what they apparently have been previously taught by other instructors or driving schools. Students that have log books that have had previous “instructed” driving lessons with a driving school should be able to apply what they have learned. We can only think that the students don’t get taught properly. If they were taught correctly it should already be built into their driving skills. Don’t misunderstand us, students do learn some things from other driving schools but at times techniques are incorrect and there seems to be the inability to be able to think for themselves which is what we would expect the have already learned. Students have far less knowledge than you would expect given the amount of previous instructed driving lessons they have had. We know our lessons are the best quality because students and parents tell us all the time they have learned more in one of our lessons than they did four or five other lessons with other driving schools. We also hear their instructors were on the phones taking bookings and talking to potential customers to the point where the students are asked to pull over. With over 60 years of Australian local driving experience not just in cars but also trucks gives us the platform to know what we are talking about. Some others who think 4 or 5 years driving experience and a piece of paper make them driving instructors. 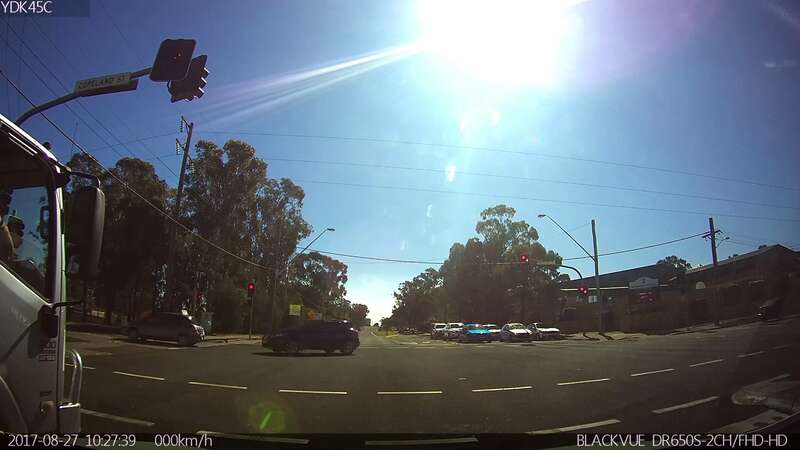 See the recent photo below taken from an in car camera of one of these cheap driving schools and this particular school doesn’t come up as a registered driving school on the ASICs website. In our view there not. If you’re not serious about proper driving lessons, just go with the cheapest. A bad teacher will result in a bad driver. Not all driving instructors can teach, not all driving instructors know how to drive! Penrith Driving School’s opinion is based on what students and parents have told our instructors about their previous experiences. Do your homework. make some inquiries, ask what you will be getting and what will be taught, there are too many driving schools all about getting your money but not providing what you are expecting. Our view is based on what students and parents tell us about their previous experience with other driving schools and the money they lost or wasted. If an instructor is not teaching informative quality lessons that help students learn to drive for themselves then students may need extra lessons and may not progress as well so this is where quality lessons are better over the cheap non-informative lessons. If you want the best quality and informative driving lessons then you should be investing in better quality lessons after all generally you get what you pay for. Penrith Driving School instructors use RMS documentation, RMS Testing Officers Manuals other photos and manuals along with videos on a Tablet to help students better understand various road conditions and situations. Always consider a single lesson prior to committing to a package of lessons to ensure you like the instructors and find out what you will actually be learning, it might save you money in the long run by having better quality lessons in the beginning. Contact Penrith Driving School today and talk to us about your driving lesson requirements. How Can I pay for Lessons/PayPal Fees? Our preferred payment method is by online bank/Internet transfer. Payment confirmation by email or photo can confirm your payment. Most online/internet transfer show within 24 hours unless over the weekend. Visa/MasterCard Debit/Credit Cards over the phone. All packages are valid for a period of 6 months from the date of purchase and should be used within that time. Pay for your next lessons or packages after your first lesson. Mobile Paywave/EFTPOS machine on site. We don’t generally accept cash payments on the day of the lesson if prebooked more than 48 hours earlier. Cash is sometimes accepted if paid prior to lessons in advance or sometimes on lesson bookings on the same day at short notice. All our payments are electronic which allows for easier tax records and RMS Auditing. Paypal is offered as a payment option but purchases will cost more so it’s your choice. If purchasing through our website using Paypal the lesson prices on the payment page include the Paypal fee. Fees apply for using Paypal as Paypal charges 2.6% + 0.30 cents which are passed onto you. Example: If paying by Paypal a $60 lesson will cost $61.91. But: Lesson is $60 so adding the PayPal a fee of $1.86 = $61.86 so why does the lesson cost $61.91 and not $61.86? Answer: In order for us to receive $60 which is the lesson cost simply adding $1.86 to $60 does not give us $60 from PayPal. Paypal charges a fee (2.6%+30c) based on $61.86 = $1.61+30c which now = $1.91. So: $61.91 – 2.6% ($1.60966) = $60.30 – 30c = $60.00. We now recieve the $60. This formula applies to all lessons and packages paid for by Paypal. Lesson prices on the main lesson price page do not include PayPal fees, these are added on the buy lesson page. Any direct payments made through PayPal to our email address which does not go through our website will need to include the Paypal fee at the lesson price indicated on the buy lesson page. This not the lesson price page, if uncertain you should contact us prior to any purchase. Note: Penrith Driving School also pays 10% GST on our lesson prices so on a $60 lesson we pay GST of $5.45 to the Tax Office. Only a few driving schools in Penrith are registered for the GST and actually pay the 10% GST on their lessons so are contributing to the economy. All Bookings need to be paid at the time of booking or within 24 hours, we do not hold lesson spaces without payment. How many lessons a student needs is dependent on their level of driving skill when beginning. New drivers with little or no experience develop their driving skills at different rates of learning. New drivers also need to gain some confidence by starting a bit slower as they are usually nervous but it doesn’t take long to see they can drive a car, some new drivers can take a little bit longer when first starting out and others progress very quickly. Quite often we hear that some driving school instructors can tell you exactly how many lessons you will need but have you achieved what you wanted at the end of those lessons? or do you now require more lessons? This can mean more money for the instructor. Buying a lesser quality lesson means you may end up buying more, get the right advice before handing over your money. A newer driver should be able to learn the basic skills in between 5 to 10 instructed driving lessons which allow parents or supervisors to then continue building the hours required. Manual driving will take longer to learn. How many lessons you have determines how much can be learned and what subjects you learn. Driving up and down straight roads, freeways or country driving does not give students the same skills as driving in built up areas so students can struggle when faced with more complex traffic situations or decision-making requirements. Focusing on built-up areas will help students learn more about decision making and road awareness. Depending on what you want to achieve lessons should be frequent for maximum benefit at least 2-3 times per week when possible or consider 90-minute lessons. Students can also progress faster by understanding the road rules, line markings and signage which they seem to forget but is very important as this forms part of driving licence requirements. Contact Penrith Driving School and we can advise you correctly the first time so take the time and talk to us. Parents and Supervisors Note: From time to time parents and supervisors can have too much expectation of their kids when learning to drive, what you may take for granted and think is easy can be more challenging for some kids. It’s not the old days anymore and sometimes you just have to have a little more patience. What if I am very nervous and have never driven a car before? Our Automatic Vehicle has an Accelerator pedal and a Brake pedal. Our Manual Vehicle has an Accelerator pedal, brake pedal, and clutch pedal. This allows our instructors to drive the vehicle from the passenger side, the advantage of this that is sometimes some students struggle to operate the accelerator, brake and or clutch whilst also trying to steer the car so the teaching can be broken down into stages. Should a student be struggling too much with a manual vehicle we suggest they try an automatic until they gain some skill and confidence. Our instructors can operate the accelerator and brake while the student can focus on learning to steer, the student can then learn how to slow the vehicle before and then after gaining some skill the accelerator is introduced. Some students can very afraid of driving at the start. By separating techniques they feel more comfortable just learning one at a time until they can combine the operation of all 3 in the or all 5 in the manual. Having an accelerator also adds to the safety as the instructor can react and respond by accelerating the vehicle should it be required. The thought of learning to drive can sometimes be stressful and quite overwhelming for some students but as with anything new once you take your first driving lesson then you are able to move forward towards your goal of getting your licence. Our patient instructors start you off in a quiet area until you are comfortable with the basics of steering, braking, and accelerating. Once you feel comfortable and have these basic controls we expand the area to incorporate the same techniques but just in a larger area so instead of maybe a small block it will be a larger block this allows students to still be doing the same left and right turns but on longer roads still in a quieter area. We have students feeling more confident with their ability driving a car from that first drive and you will gain more confidence and build on your ability with every lesson after that. Think about as maybe playing a sport or going to a new job where in the beginning you were nervous and didn’t quite know what to do but after some training, you felt more comfortable. Just getting into a car and driving may seem easy for some but there is a lot more involved and there has to be a process of development over time just as with anything we learn. Contact Penrith Driving School for all the right advice the first time. What is our Driving Test Pass Rate? This is a common question that seems to have a high priority when we get inquiries and some driving schools claim they have the best pass rate or the highest pass rate but do they really? With all the accidents involving “P” platers and new drivers these days, it is extremely important that the reason for getting your licence is because you are ready to drive independently as inexperience and bad decisions is a major cause of accidents. When Penrith Driving School instructors say you’re ready for your P1/driving test you pass your driving test the first time because you are a better driver so this pass rate is 100%. We don’t discriminate against students with disabilities or those drivers from overseas who may only hire our car for the purpose of a driving test. We always access anyone using our cars and if they are unable to drive to a safe standard then our cars are not available for the driving tests. Most of these drivers will fail if they have not done any driving lessons before their driving test so this will reduce the pass rate for those who chose to do the driving test by themselves without any lessons. This is because they aren’t driving to the RMS testing standard as they may not be aware of the requirements needed to pass a driving test. Some other driving schools do not accept overseas students or overseas drivers or those with a learning disability because it’s more about maintaining a higher pass rate so they are selective on who they teach. Some driving schools will not allow you to use the instructor’s car if they think you fail which also affects their pass rate. The pass rates for those students or drivers who decide that they just want to do the driving test is around 50%-60% which has nothing to with our pass rate. Our instructors indicated to these students or drivers that in our opinion they weren’t ready to drive by themselves because of inconsistent decision-making and instructor intervention, not understanding the road rules means that students aren’t driving by themselves but that doesn’t mean the can’t attempt the driving test using our car but when they fail this has nothing to do with us it’s their choice. Anyone can attempt the driving test if they qualify. It seems to be all about the getting the licence, not about the responsibility that having a licence brings and from what we regularly see students turn 17 or complete their 120 hours and in their view or their parents view they ready for the driving test. It’s not about whether you’re 17 or have completed your 120 hours this only “qualifies” you to “attempt” the driving test. It should be about if you can drive properly as an independent driver before attempting the driving test. The pass rate of overseas drivers can also be lower at times as it is all about getting their licence even though they are not ready to drive by themselves as they can struggle to drive properly to meet the RMS requirements. They do not having a good understanding of the road rules which results in incorrect driving decisions and poor vehicle control. Overseas drivers that waited until we indicated they ready are always passing the first time without a problem it might take a bit longer but they are better drivers overall. You have to think beyond the driving test and how driving independently brings more decision making and responsibly as it only takes one error or mistake that can bring fatal consequences not only to the driver but passengers or other road users. It can take more than one lesson to change bad habits or to improve students driving to a safe standard to pass the RMS driving test. When students don’t pass this is not our fault but rather their own fault as they chose to undertake the driving test against our opinion. Penrith Driving School can give you the right advice the first time so why not contact us today and get prepared properly not for just passing your test but to drive well independently after you do pass your test. Driving Lessons can be conducted in personal cars on request. We do not use cars that have a foot brake or an electrically operated park brake. Cars must be 4 or 5-star safety rated. If a car is not roadworthy the lesson must be conducted in the Penrith Driving School if the student or customer does not want to that lesson in the Penrith Driving School car the lesson will be cancelled and the lesson fee will still be charged. We do not do lessons in cars that have no insurance or are not roadworthy. The registered owner of the vehicle will be required to sign an insurance waiver saying they understand that no claim will be against Penrith Driving School or any Penrith Driving School instructor for any damage to the personal vehicle being used for a driving lesson. It will also say that Penrith Driving School is not responsible for any insurance excesses if the car was to be involved in an accident at fault by the driver should that occur. Our instructors will not be held liable for any damage that may occur in personal cars during a driving lesson caused by the student. Penrith Driving School vehicles are fully insured against both accident and mechanical damage should any damage be incurred by a student when under our instruction during a driving lesson or driving test as required by the NSW Legislation so the student will pay nothing or be liable for any excesses. Our cars are also air-conditioned. Our cars are 5-star safety rated. When am I ready for my P1 driving test? For learners with a log book under 25 years old, you can attempt the P1 test after completing 120 hours which must include 20 nighttime driving hours. You must be 17 years old. If you are over 25 years old you can attempt the driving test when you are ready. By completing the 120 hours or being over 17 doesn’t mean you are ready for your driving test it just means you qualify to undertake the driving test. Just because you feel you can drive a car doesn’t mean you can drive properly so depending on your level of knowledge, experience, and ability you may struggle during the driving test if you haven’t been taught correctly or are not aware of the requirements needed to pass a driving test. Manual is more difficult as there are more marking components added during the test. If you are ready for independent driving then you should be able to drive anywhere you are directed by an RMS assessor or by us as instructors without any assistance and be able to perform all maneuvers with confidence. We can access your ability prior to your driving test so don’t leave too late. Contact us for more information or read our “P1 Pass Guarantee” on this page. It’s not all about racing to get your licence if you aren’t ready to drive by yourself so get some more experience or undertake some more lessons. One mistake can have serious consequences so don’t just rush to get your P1 licence if you are not ready to drive independently by yourself. Contact Penrith Driving School for more information or any questions you may have. What if I fail my P1 driving test? Not passing your driving test just means you will have to try again but you should ask yourself why didn’t you pass? Not passing your driving test can be a warning that you weren’t actually ready to be driving by yourself independently. If you were ready to drive by yourself then you would have passed your driving test. Too often students and parents put failing or not passing a driving test down to “nerves”, a “mental block” or maybe feeling sick. Time for a reality check, you can’t afford to be nervous or be having mental blocks, feeling sick or not understanding road rules. When you’re out on the road driving by yourself in the presence of other road users you need to be confident. If you didn’t pass it’s because you made errors or maybe the assessor had to intervene to avoid you making a wrong decision that could have resulted in an accident. A motor vehicle is a dangerous weapon if not handled correctly by the driver so you cannot afford to be losing control or making incorrect decisions when driving as this can result in very serious accidents so don’t rush to get your licence. A driver should be confident and have solid vehicle control and a good understanding of the road rules. Some signs that you may not be ready could be: you are “very nervous“, “hesitating“, “not sure about road rules“, “not feeling confident when behind the wheel“, “driving too slow for traffic“, “continually speeding“, “poor vehicle control“, “don’t understand the traffic” to name a few. You should consider some more practice maybe get some professional advice by having some driving lessons to determine if you are ready to drive independently. Accidents are the results of mistakes, incorrect decisions and in some cases just plain stupidity. You should also think about how many times the news reports accidents involving “p” plater’s and inexperienced drivers so get assessed by us because your driving only just starts after you get your licence. Statistics say “p” plater’s and inexperienced drivers are most vulnerable to accidents in the first 6 months of getting a licence. Contact Penrith Driving School where we can help answer your questions and give you the correct advice the first time. Our normal lesson times are 60 minutes, 90 minutes subject to the area. 120 min lessons available by request. The best lessons are 90-minute lessons as these reduce the days needed and may reduce lesson costs. 90-minute lessons allow for more variation and skill training during a lesson. Better quality lessons can teach you to how to become more independent as a driver much quicker. Students need to meet the RMS requirement of skills and knowledge so start early. Lessons need to be conducted in areas that meet the RMS testing criteria and areas that are suitable for teaching. Living outside training areas reduce lesson times of quality training as traveling to and from has to be taken into account. Some areas require more travel to and from so 90-minute lessons may only be available. Although students may be driving from their suburb they may not be gaining more complex driving skills from the RMS training areas and areas that our instructors use for teaching. Will I be a good driver after my lessons? Becoming a good confident driver is not a skill that can be learnt in a short time you need to be learning correct driving fundamentals while having quality training during your driving lessons and the more different varied types of driving you do, the more you will learn. You go to school to learn so consider going to a driving school to also learn. Most supervisors teaching people to learn are teaching lessons based on their own driving experience of how they drive, whilst this can be of benefit it may also teach bad habits and the wrong techniques. Depending on how many lessons a student may have will determine how much they can learn and what subjects they are learning. You should remember that for learners they are required to accumulate 120 hours of driving experience and also complete the 20 learning goals in the RMS log book so don’t expect instructors to be able to teach this in a handful of driving lessons. Manual vehicles will always take longer to learn as they are more complex and students do take longer to learn. Most students can learn to enough to drive in normal traffic conditions with supervision and some perform basic maneuvers so they can build more confidence and gain more experience as they build their driving hours. What they are learning is dependent on how many lessons they have and their ability to learn. What is learned in the early stages of learning to drive may determine what type of driver you/they end up becoming as too often we have students coming to us when nearing their driving test and we continually see they struggle with driving properly and being able to drive independently? Always consider some professional advice as you may only get one chance. Contact Penrith Driving School now for further information and the right advice the first time. Where do you conduct Driving Lessons? Learner drivers are required learn to the driving criteria of “learning goals” as set out in the RMS Learner Log Book. This means that we need to conduct lessons in areas that have suitable driving conditions such as stop signs, give way signs, simple and complex traffic lights and traffic conditions, roundabouts, multilane roads, hills, bends in order to train and teach students properly. What students learn is dependent on how many driving lessons they may have and what subjects they want to learn. The more subjects the more lessons it takes and can also be dependent on the student’s ability. Penrith is the main training area used for lessons, St Marys and Mt Druitt areas are used in pre-testing but the Penrith area is the main suitable area for teaching those students or people who are preparing for the RMS Driving Test where the RMS conduct driving tests so training in these areas is a requirement to be able to teach students properly. Yes, our cars have dual controls. Automatic vehicles have a brake pedal and accelerator pedal fitted to the passenger side for the instructor. Manual vehicles have a brake, clutch and accelerator pedal fitted to the passenger side for the instructor. Vehicles are engineered and certified by the RMS as dual control vehicles. Our vehicles allow for better teaching and demonstrations than vehicles with brake pedals only or brake and clutch only as it reduces the requirement to continually swap seats. Penrith Driving School offers an RMS Driving Test Pass Guarantee to our students when they are assessed by us as being ready to undertake the RMS P1/Driving Test. It’s not just about passing your test it’s also about becoming a better and safer driver if that is your goal. Driving licences come with responsibility and the way you drive will determine if you are a responsible driver or an irresponsible driver. There are too many accidents these days involving “P” platers and inexperienced drivers that could be avoided by having more experience and more knowledge which may help avoid an incident in the future. Qualifying for our “first-time pass guarantee” also shows that our students are much better drivers as it is more about driving independently and being able to think better for themselves when driving. The “pass guarantee” is not available to those students who decide they are ready themselves or just want to attempt the driving test of their own accord, we still do the driving tests but there is no guarantee they will pass first time if they haven’t been assessed by our instructors as being qualified under our pass guarantee. The pass rate of these students who decide they are ready is always lower as they haven’t shown us as instructors they were ready for the driving test or to be driving by themselves so consider some more practice or maybe some extra lessons if you’re not ready as the consequences can be serious. The “driving test pass guarantee” is only available to students have successfully passed our pretesting and independent driving requirements that will indicate to us when they are ready to go for your driving test. Our instructors will determine when you are ready to undertake the RMS Driving Test using the Penrith Driving School vehicle they have been using for their driving lessons. Our assessment of your ability is based on your pre-testing lessons with our instructors who will have assessed your ability during your pre-test driving assessment prior to your driving test but cannot guarantee your future driving ability as this is determined by you. Our assessments are conducted with instructor and student in the vehicle, how you drive by yourself is up to you. Our instructors decide when you are ready for your driving test, not you. So far all students that qualified and have been assessed by us for our “pass guarantee” have passed the first time some have had perfect scores on their RMS test sheets. If for some reason you do not pass the first time the guarantee is limited to Penrith Driving School resupplying the vehicle and instructor for another test at no cost to you. We will also pay for your driving test booking which is currently $54. Students are still responsible for their licence fee after they pass their driving test which currently is $54. I am from overseas/interstate and want a NSW licence. We can help students or people from overseas or interstate obtain their NSW driving licence. Not only is it important to be able to drive correctly it is important for overseas drivers to fully understand the road rules and be familiar with the road signs, traffic lights and line markings. Without this understanding, you will struggle. We can help teach you how to drive in NSW and learn the road rules but it doesn’t happen overnight so be prepared for some lessons. A booking that is made with Penrith Driving School is the same as an appointment and should be treated as such, we reserve that time and on the day, you have requested. We require a minimum 1 full days notice to be given if you intend to cancel or reschedule your lesson so we may try to use that booking space for another student. There is no charge for this. Cancellations or reschedules with less than 1 full days will result in a lesson cancellation fee or lesson deducted from packaged lessons. When you book a driving lesson time with Penrith Driving School we reserve that day and time exclusively for you and expect you to attend. Our commitment to you is to keep your booking time which is what you expect of us so we expect that you will keep your booking otherwise we prefer to give that booking space to someone who is able to attend the lesson. Please do not make bookings if you unable to keep them as this disrupts our business and prevents us from booking someone else. Inform your boss that you have a driving lesson on that day and time so as to avoid canceling at short notice. Everybody has mobile phones these days and can set reminders just as we do in our calendars. To say I “forgot” is not a valid reason for non-attendance of a driving lesson, we remember so, should you. Our instructors send you a text message at the end of every lesson indicating your next lesson if you are on packages and are able to book at that time. If you don’t know your roster then a lesson will be booked once you contact us and we can book an available time for you which then confirms you lesson booking. We keep the text as a record of the booking so you also have the day and time. We will charge a lesson fee or deduct a lesson from packages for non-attendance or cancel a lesson at short notice it’s up to you to be responsible and attend your booked lesson or don’t make the booking. You should book your lessons early to guarantee availability for your next lesson. Should a Penrith Driving School Instructor be running late you will be contacted prior to the booked time of the lesson and advised. We will extend the lesson to make up for the lost time in most cases. Lesson packages are valid for a period of 6 months from the date of purchase. See our Terms & Conditions for further information. We provide all relevant information that can be used when deciding to purchase driving lessons from us which is available on our website or by phoning us. We will be happy to answer any of your questions. We offer the “try before you buy” to allow assessment of our lessons prior to purchasing a package or continuing to purchase lessons. Buy a single lesson and when you are happy the cost of that first lesson can be deducted from a package price but payment can only be by card or bank/internet transfers not through our website as the discount cannot be applied. We do not refund on lessons or driving tests for a change of mind. Also, see cancellations for other information. If you have made a purchase incorrectly from our website and paid through Paypal there will be a refund fee charged. This fee is charged to us by PayPal for initiating the refund. The purchase was not our fault so you have to pay the refund fee, take it up with Paypal we shouldn’t have to pay for your mistake. Packaged lessons or gift certificates may be transferred to another person with the written permission of the original purchaser but are not redeemable for cash and will be of the same type purchased in lesson areas only. If you have a particular issue or concern you should contact us.